Chloromycetin is one of the first natural anti-microbe medications produced at the end of 40s and since then many bacteria have developed resistance to it. It also causes severe side effects and its usage is limited at present time. 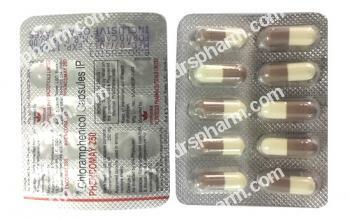 It is mostly used to treat meningitis, rickettsial disease, salmonellosis and anaerobic infections. Its mechanism of action is associated with blockage of bacterial protein synthesis in ribosomes, thus its effect is bacteriostatic, but can also be bactericidal in high concentrations for pneumococci, meningococci, and H.influenzae. Chloromycetin is usually administered for treatment of bacterial infections of eyes (locally) and sometimes does also for treatment of bacterial meningitis, brain abscess, generalized forms of salmonellosis, typhoid fever, rickettsiosis: Ku-fever, Rocky Mountain spotted fever, typhus, intra-abdominal infections, pelvic infection, gas gangrene, plague as a secondary drug. Do not use this drug if safer, effective medications is available. Take exactly as prescribed do not miss your doses and take them through equal time periods. Avoid recurring treatment with the same medication. Take tablets with a full glass of water. Follow exactly all instructions if you use Chloromycetin liquid locally. Tell your doctor about all other illnesses and history of allergies (especially to antibiotics) before to take Chloromycetin. In some rare cases Chloromycetin may cause serious, even fatal, blood disorders (for instance, bone marrow hypoplasia, aplastic anemia) so monitoring of blood is needed on a regular basis. Treatment with antibacterial agents alters the normal flora of the colon leading to different intestinal disorders ranging in severity from mild diarrhea to fatal colitis. Gray baby syndrome (in neonates) involves hypothermia, cyanosis, flaccidity, and circulatory collapse, is often fatal. Chloromycetin increases period of excretion and effects of peroral anti-diabetes medications and may show false positive results in glucose tests in patients with diabetes. Co-administration of Chloromycetin with erythromycin or lincosamides is not advised. Chloromycetin is able to diminish effects of medications which contain iron, folic acid and B12 vitamin. Signs of overdose may be: easy bruising or bleeding, persistent sore throat, fever, or unusual fatigue, headache, mild depression, mental confusion, rashes, angioedema. If you suppose that you took too much of this medication contact your doctor for help immediately especially if you have watery and bloody stools (with or without stomach cramps and fever). Store at room temperature between 59-77 degrees F (15-25 degrees C) away from light and moisture, kids and pets. If you keep Chloromycetin in a refrigerator do not freeze it.